Abruzzo is a tough place to get to (I remember taking a 5 hour train ride from Rome to Pescara) but when you do get there you are rewarded with one of Italy’s most wild and natural regions. The territory is a harsh one, in fact it’s almost 70% mountainous, and the local farmers have learned to best utilize their surroundings. In the southern part of the region you find Cantine Mucci, a stones throw from the Abruzzo coast, in a lovely little village Torino di Sangro. Here, my Mucci ancestors left for America close to a hundred years ago, and I’m sure it was difficult to leave such a beautiful area behind. Upon arrival to Cantine Mucci, I was almost always greeted by “nonno” Valentino, who until his recent passing, was usually in the field grabbing some vegetables for dinner. He would hand his granddaughter Aurelia (now together with her brother Valentino, the face of Cantine Mucci) and I some fave beans to snack on as we enjoyed a lovely sunny afternoon in the vineyard. 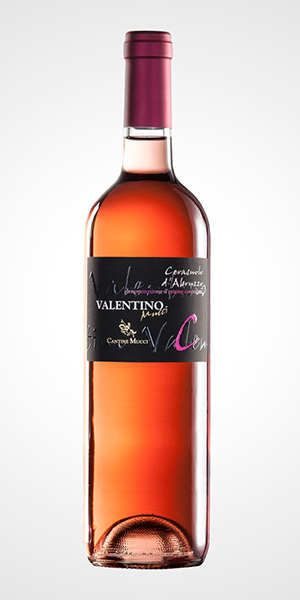 Valentino was an integral part of the team, as he would spend at least an hour a day bottling Cantine Mucci wines. Here, family is always most important. 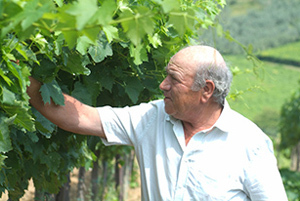 There is also a great deal of passion and respect for the environment in the creation of fantastic wines made from the best local grapes Abruzzo has to offer. Luigi Mucci created Cantine Mucci in 1895, preaching this respect and care for the vineyards that is apparent in the glass. Today, three generations of Muccis work together hand in hand to create Pecorino, Falanghina, Montepulciano and Trebbiano among others. Dinner on the coast in the land of the Trabocchi, old spider-like fishing docks, is a great way to get a feel for the local cuisine. Marinated anchovies, whole fish soups, and grilled octopus are just a few dishes that can be enjoyed with a local Pecorino and Cerasuolo. Meals start with the rose (Cerasuolo) whose fattiness and tannin help cut through some of the heartier fish antipasti. Pasta and clams most likely come next. And don’t forget a whole fish preparation just when you thought you had no room left in your stomach. Kelsey and I always joke that we spend more time eating than doing anything else on our wine travels, but nowhere is this more true than when we are with family in Abruzzo. In 1895, the Muccis started selling their grapes to larger cooperatives before selling those grapes to smaller individual bottlers. The most recent phase, of course, is utilizing their grapes to produce their own very high quality wines. Gone are the majority of the international varietals they planted historically to sell off. Within the last 10 years, a small 2 hectare plot of Pecorino has been planted. They have had so much success with this that I expect the amount of Pecorino grown on the property to triple within the next few years. The Muccis were the first to plant Falanghina in Abruzzo (as of now there are still only 4 or 5 others in Abruzzo who grow it) in the late 80’s. When Nicola Mucci was studying enology in Campania, he fell in love with the varietal and decided to take a chance and plant it on his property. He took a shot that has really paid off! 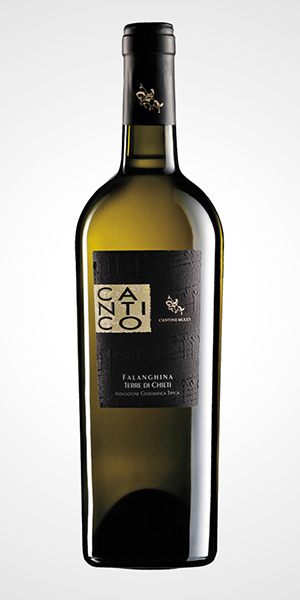 The wine was planted in a portion of the property where there is a high concentration of clay, which has helped to create a one of a kind Falanghina. In total the Muccis have about 40 hectares of total land. 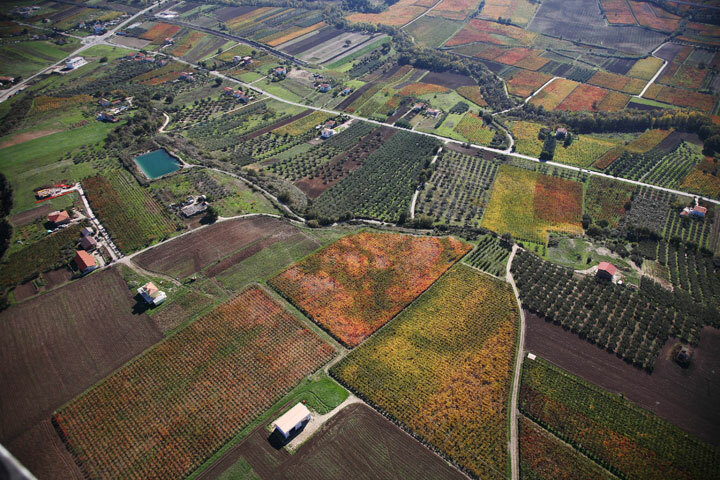 Much of that land is dedicated to olive oil production, which they have also produced for over a hundred years. A huge chunk of the vineyards grows the local star grape varietal, Montepulciano d’Abruzzo. The vine training and age of the vines vary, which helps them to produce different styles of Montepulciano. 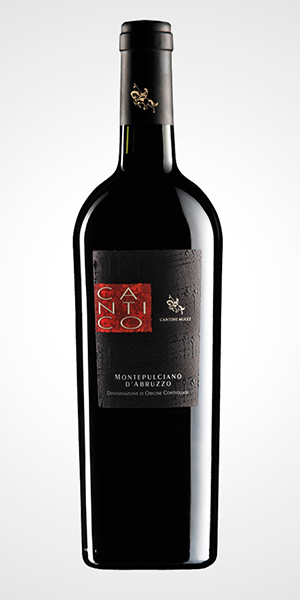 For the Cantico line, their high end Montepulciano, most of the vines are grown in the “tendone” or canopy style. This literal canopy, when properly and carefully managed, helps shade the grapes from hot Abruzzo sun, allowing for a more balanced wine. What is amazing about each individual vineyard site is the diversity of the soil. Most small producers will follow the lead of the soil, planting certain varietals in soil conditions that they believe the varietal have the most success. In the darkest, heartiest of soil goes the Montepulciano that will make the Cantico. Their Valentino Montepulciano, on the other hand, will come from a mix of clay and calcareous soil, which will lead to a less robust wine. There is a great diversity of soil compositions, plant life and fruit at Cantine Mucci. All of this contributes to the unique DNA of this property and the wines which come from it. Intense straw yellow color shows that this wine has aging behind it. On the nose the tropical fruit aromas are heavenly, with melon being the most apparent. In terms of mouth feel, the oak aging helps give this wine great structure and a certain richness. • Antipasti: prosciutto crudo, coppa, marinated salmon. Refined in stainless steel vats with inert gas protection; the remaining 50% in barrels with racking at the end of bâtonnage until March. The two parts finally are blended together in bottle. 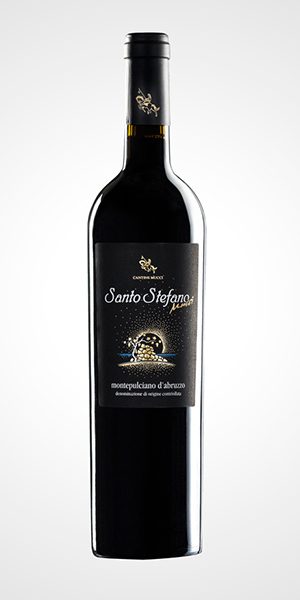 Intense ruby red color, with hints of cherries, blackberries and liquorice, smooth and well-balanced tannins. • Goes great with a cuban cigar on the back porch too! Refined in stainless steel vats protected by inert gas, clarification and bottling. Aging in medium toasted French oak barriques for 12 to13 months. The barriques are stored in climate controlled quarters, decanting and refilling to the brim throughout the period. A sparkling blend of Pecorino and Falanghina, you kidding me? Nope. This is what all the cool kids on the Abruzzo coast are drinking right now! Straw yellow color with greenish hues. There are tons of exotic fruits happening here, grapefruit, peach, passion fruit with a slight lip puckering sour note. The bubbles are quite persistent making for a very refreshing wine. What an elegant wine this is with some awesome acidity helping to make it complex yet extremly refreshing and easy to drink. Grapes are harvested from the 5th to the 15th of September for both the Pecorino and Falanghina. A primary fermentation in stainless steel occurs according to the the Charmant method, obtained directly from the grape must. Second fermentation occurs in autoclave, until the wine reaches 5.5 bars of pressure. At this point there are 15g/L of residual sugars. The wine will then spend a month in autoclave at 41 degrees fahrenheit and then a month in the bottle before being available for sale. Refined in stainless steel vats protected by inert gas, clarification and bottling. Cherry red color, fragrant with notes of fresh strawberry, full bodied and soft. In some vintages, the wine will even have pleasant tannins. 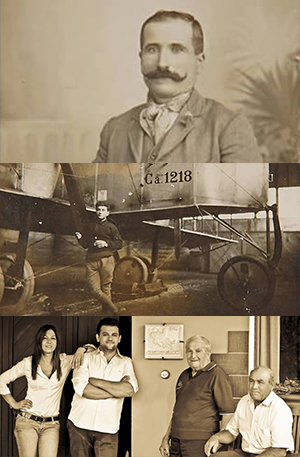 The Muccis have been mastering the Montepulciano grape since the late 1800s. Since there were a few Mucci families in this region in the mid 20th century, each one was given a nickname to differentiate the families. Our Muccis were given the name “Cianos”, short for Montepulciano, as they were well known for having success with the grape. 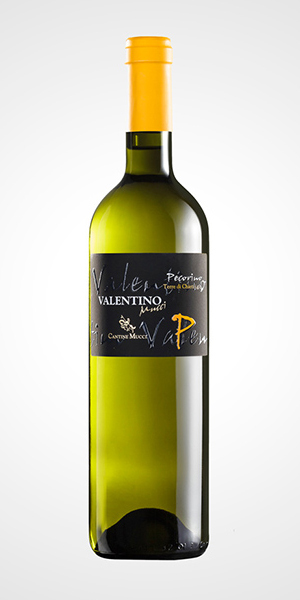 Valentino is their truest form of the grape, without oak and capturing the essence of the varietal. Notes of violet, soft earth and round red fruits, bright acid and pleasant tannin. Anything from pasta with pomodoro to roasted meats, the wine serves as a versatile partner with a range of foods. After the malolactic fermentation, decanting and aging in stainless steel vats until bottling. 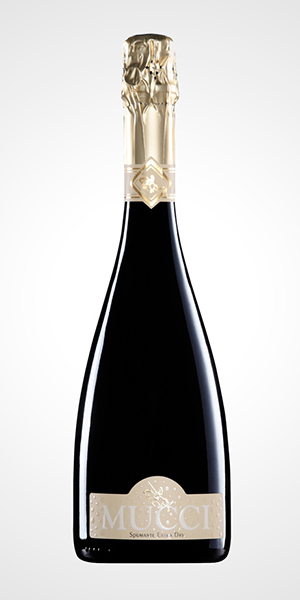 Deep red ruby color, with an aroma of ripe fruit combined with a hint of spice and vanilla. 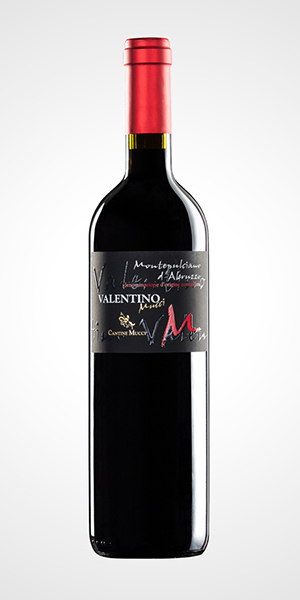 Rich, velvety, with good structure that is moderately tannic and balanced. The Santo Stefano grows in a plot of land that has higher elevation and a bit marine influence because of its close proximity to the ocean. At the entrance to the hillside plot are the remains of a monastery built by Santo Stefano centuries ago. The grapes are harvested a bit earlier than the Cantico Montepulciano. After the malolactic fermentation, decanting and sulphuring and eventually aging in barriques in climate controlled quarters.